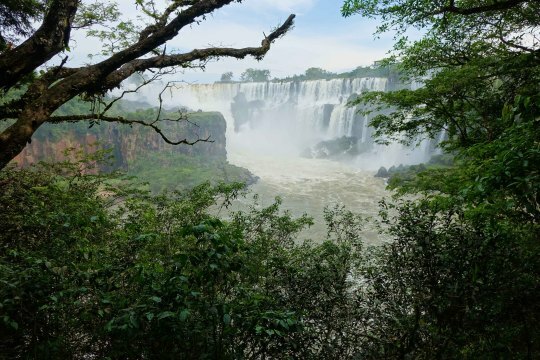 So, today was my day of exploring the falls of Iguassu. You can access them from both Brazil and Argentina, but I’d read the Argentinian side was more impressive, and worth spending longer at. After a quick breakfast, I got the shuttle bus back to the park exit and a taxi was waiting. 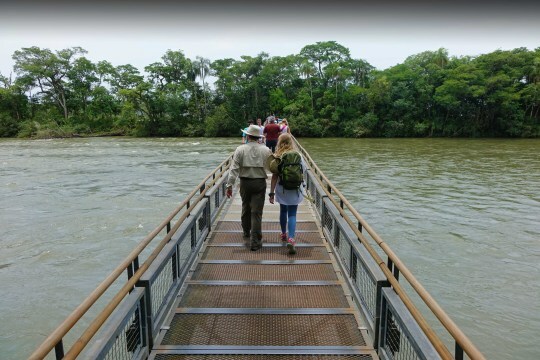 The driver would take me across the border to Argentina, to the national park, drop me off and collect me – so a two hour round trip for around £40. But there was some stress involved… first I needed Argentinian Pesos. There’s apparently an ATM at the park, but sometimes it’s not working. So reluctantly, I agreed that the taxi driver would take me to an currency exchange place near the border. I just got the feeling I was gonna get ripped off BIG TIME! The hotel’s ATM wasn’t working, so I went to one at the Brazilian park entrance to get money out to change. My card wouldn’t work in any of them. So then I tried my American Express card, which worked, but which meant I was getting charged interest and a foreign fee, unlike my other card. Grrr! Then I tried calling my first bank to find out why my card wouldn’t work, but my phone didn’t work. So I had to call the phone company. They said they’d done something and it should now work, but it didn’t. So I got more stressed. Finally I just switched to my UK sim, called my bank, and they told me my card should be working fine, before I got cut off. Brilliant! We travelled on to a souvenir shop which had a foreign exchange counter (GRRR). Whether I was being ripped off or not, I actually got a better rate than the official one. It turned out they were using the ‘black market’ exchange rate for pesos, which although I’m sure I wasn’t getting a great rate for the black market, it wasn’t as bad as the official rate! Crossing the border, I’d read I had to get my passport stamped to say I’d left Brazil or I could get fined on the way back in. But the driver refused to listen to stop, telling me it wasn’t needed. I’m not gonna lie, the whole palaver was a bit stressful, so I was relieved to at last arrive at the park. Hooray! After buying a ticket for about £17, I arranged for my taxi man to meet me at 4pm and headed inside. Literally the first thing I saw was one of these. 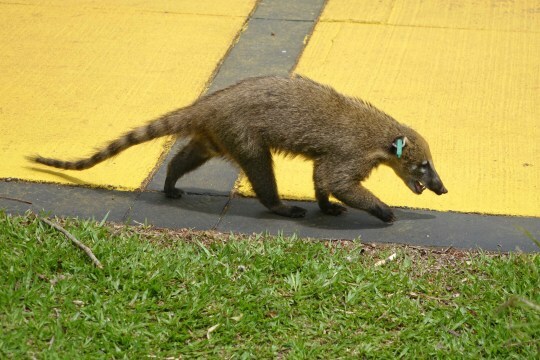 A coati. They look pretty friendly right? Except apparently they’re not – they’ll bite and try to pinch food from you. 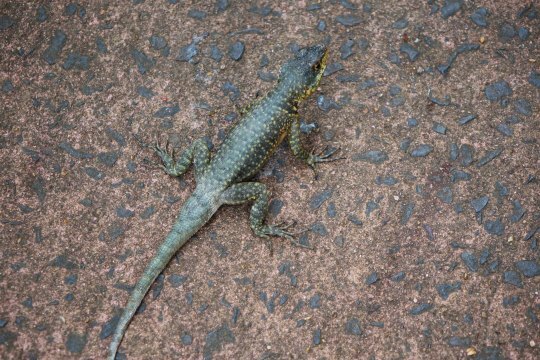 I saw literally hundreds of them at the park though – and a lot of them were hanging around food areas. 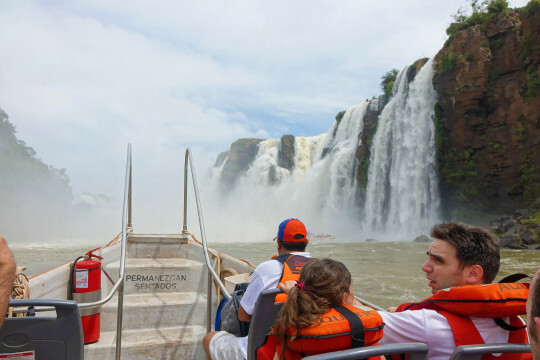 I checked out a stall offering boat rides under the falls (or near them anyway) and after chatting with them, decided not to book a ride there and then, but to wait until I’d explored the park a bit more so I knew what time I’d be able to take one. The train was packed! But it was a chilled out ride. 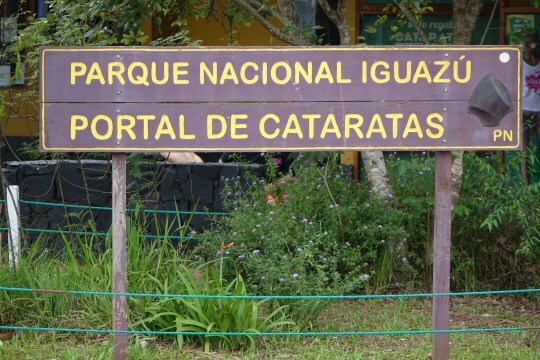 I even saw a wild toucan, but didn’t get my camera out in time. For what seems like forever. And it doesn’t seem either like there are any waterfalls anywhere near you! And also though it may not look it, it was very, very hot. But still, it was a pleasant enough walk, and I was beginning to forget all my cash / phone drama from earlier! 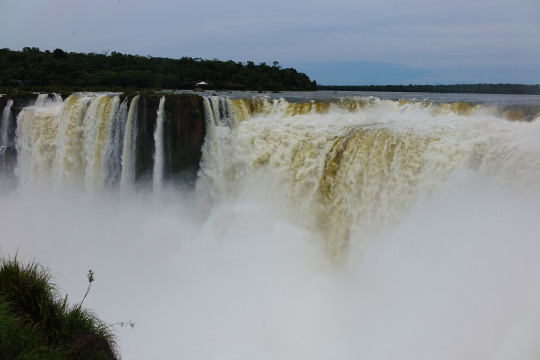 Finally, I arrived at The Devil’s Throat itself – the top of the waterfalls. And it was amazing. They are just ENORMOUS. It’s just totally breath-taking, and I don’t think a photo can do it justice really. The roar of all the water is deafening. 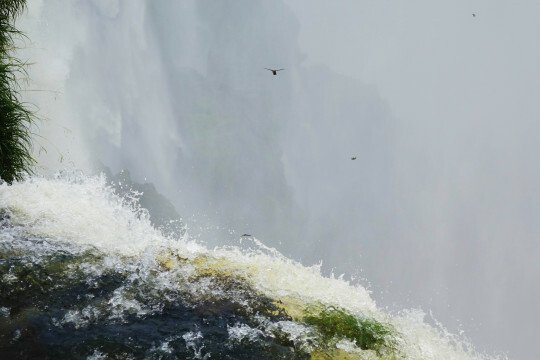 What really surprised me is there were loads of birds flying right beside the falls. I learnt later (thanks to a documentary on my TV in the hotel!) that they’re swifts. The swifts basically live on the cliffs right beside the falls, and the water helps keep them free of pests. They make their nests there, and their babies are born in cracks in the cliffs. I thought that was pretty amazing really! 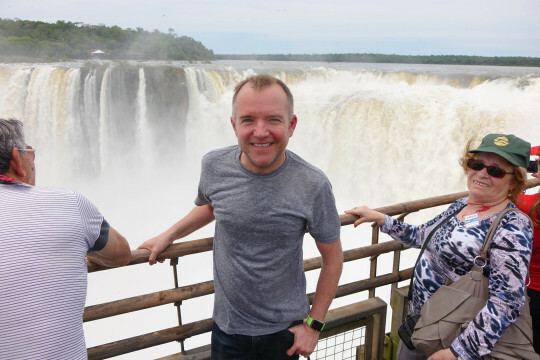 I got my photo taken by a friendly fellow tourist – you can see how wet it was around the falls! I was in a mad panic by this point as my phone said it was 1.40pm and I’d been told the latest boat trip I could take to meet my taxi driver at the right time was 2.40pm. However, it was only 12.40 as my phone hadn’t switched over to Argentinian time. Hooray! I caught the train back down to the centre of the park, and grabbed lunch. 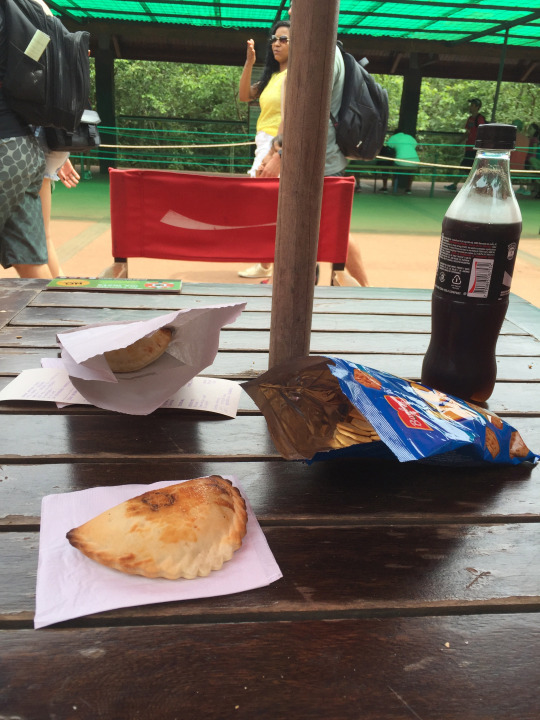 Everything in the park’s a bit of a rip off, there’s very little choice – basically empanadas or weirdly Subway. I took the more authentic option…. 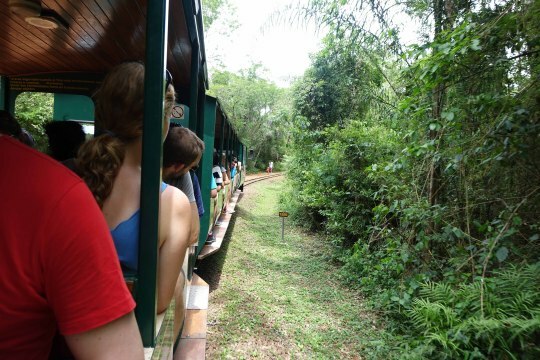 There’s two trails in the park apart from the one to the Devil’s Throat – Circuito Inferior or Circuito Superior. Weirdly, the Inferior is the longest and best, so off I trekked. It wasn’t long before I had another amazing view of the falls. It was just awe-inspiring. Finally, I reached the point where you boarded the boat trip. There were a couple of different options you could take, but I chose the shorter, cheaper one, that does one trip past the falls for photos and then another one for a soakin’. It lasted about twelve minutes and cost about £24. No-one was standing up to take photos, so I didn’t – didn’t want to rock the boat (ahem). A couple of minutes later, and we were told to put all our stuff in the dry bags they’d given us, and we roared right into the falls you see on the right. They weren’t the big massive ones, but we still all got absolutely drenched. It was good fun, but I was completely soaked through to the skin. Thankfully it didn’t take too long to dry off in the sun. After that, it was time to head back to meet my taxi driver. 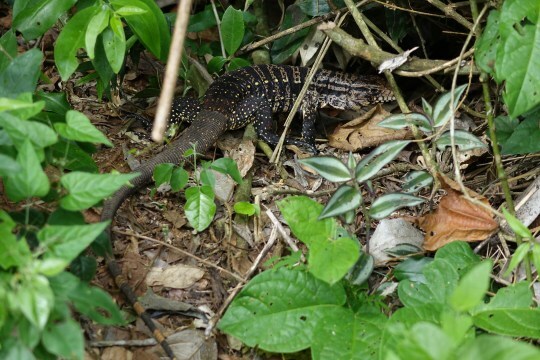 On the way I spotted some lizardy type things. I’d really had an amazing day out. 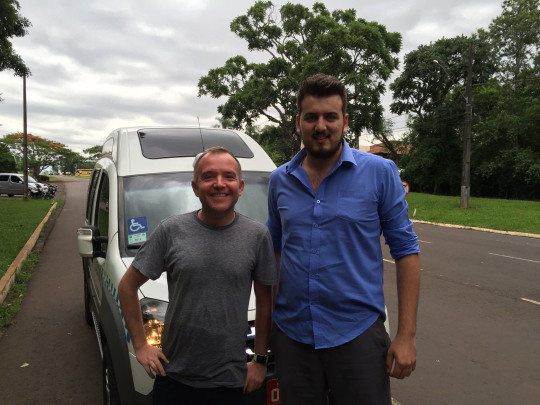 I met my taxi driver, and we headed back across the border to Brazil. Yes his windscreen was filthy. Immigration wasn’t a problem as we just drove right through without stopping. Hmmm! I was hoping to get some pool time in when I got to the hotel, but it was teeming down with rain, so I went for a quick sauna before heading to the restaurant for dinner. It was the same amazing buffet, so I was quite happy with that! 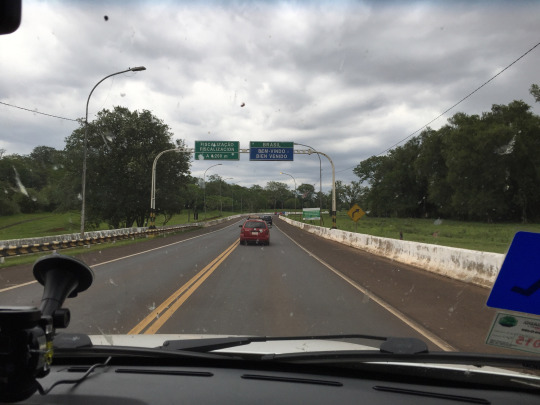 I went back to my room, and started packing – I’d be leaving Iguassu – and Brazil – behind the next day, but I’d still squeeze a bit more in before I left.